Generalized additive models are proposed for a better understanding of the underlying mechanisms for anchovy variations in abundance. Environmental variables derived from satellite imagery (surface chlorophyll, sea surface temperature and wind-mixing index), river discharge (Rhône River and Ebre River) and anchovy landings (landings per unit of effort) as proxy for abundance were used, and three fishing zones were defined along the Catalan Coast. A time shift among wind index mixing, sea surface temperature and chlorophyll was observed for these variables to be significantly correlated with anchovy. Results pointed out to processes that appear to greatly influence species abundance and affect different life stages of anchovy (conditions preceding reproduction, larvae growth and survival and recruits growth). A high proportion of anchovy LPUE variability could be explained by environmental variables. Thus, some univariate models explained deviance are more than 50%, even up to around 70% of anchovy variability. In several cases the deviance explained by a given variable was even higher at the longer time-lags. 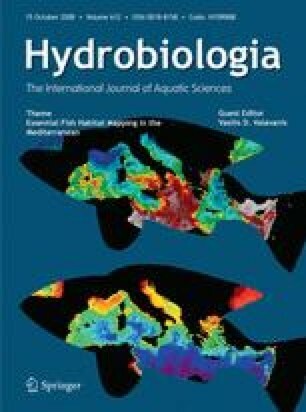 Among all univariate and bivariate models fitted, the model that best explained anchovy LPUE variability, 79% of total deviance, was a model proposed for the central zone, based on the additive effect of surface chlorophyll and Rhône River discharge, considering time lags of 15 and 18 months, respectively, for each variable. We acknowledge the DGPAM, the General Direction of Fishing and Maritime Affairs of the Catalan Government, for providing the data on the anchovy fishery. This study was funded by the EC EnviEFH project (SSP8 Contract Number 022466). FAO Fish Stat Dataset, http://www.fao.org/fishery/statistics/global-capture-production. SAC-GFCM, 2007. Subcommittee of Stock Assessment-General Fisheries Commission for the Mediterranean Assessment Forms. Doc7anchovyGSA07, available at: http://www.icm.csic.es/rec/projectes/scsa/.